Just in case you don’t know me from Adam, I have a food blog and a facebook page. Every night I ask my readers, “What’s for supper at your house?” Well let me tell you, there are some pretty fabulous cooks out there that inspire me daily. So much of an inspiration, that they said, “Nettie, I made this fabulously easy One Pot Pasta last night, you have to try it! !” Actually 10 readers told me this, how could it not be?? Well I had all of the ingredients on hand, threw them all in a pot….they were right, it was wonderful and it only takes twenty minutes! My kids loved it!! Now I used chicken broth for my recipe, you can use vegetarian broth, you can put cooked chicken in it, or sausage, or ground beef. I used canned tomatoes and fresh tomatoes from my garden. You can switch it up, using what you have in your pantry and fridge! Give it a try! Place all ingredients (except the extra salt and pepper) in a large stock pot. Stir, and reduce the heat to low. 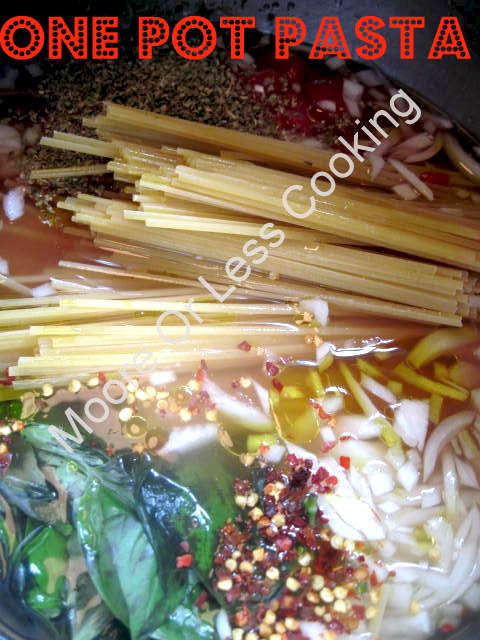 Let simmer for 10-15 minutes depending on the thickness of your pasta, stirring occasionally, until pasta is al dente. Remove from heat. Add salt and pepper to taste. Allow the pasta to sit for 5 minutes. There will be a small amount of liquid remaining in the pot. Toss the pasta to coat with the liquid. As it cools, the liquid will thicken into a sauce-like consistency due to the starch from the pasta. Serve hot. Garnish as desired with parmesan cheese and fresh herbs.